"I want Emma Burke. I always have. And I'm going to fight like hell to make her mine. I know a thing or two about fighting." Ginger Scott.....there is only one question I have for you. Can I claim Owen and Andrew all to myself? (**please note- I am here picturing you nodding and agreeing with me that I can have those Harper Boys. haha**) Wicked Restless is the second and final installment of The Harper Boys and one of my most highly anticipated YA/NA book of 2015. When I first read about Andrew Harper in Wild Reckless, I wanted to know more about him. And let me just say, Ginger did not disappoint me with this book!!! Ginger Scott DELIVERED!!!! 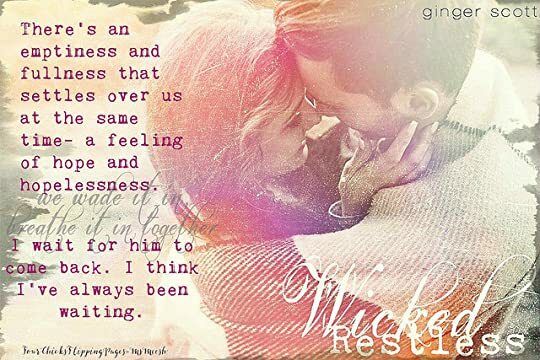 Wicked Restless was an emotional, slow burn second chance romance that was brimming with so much passion, angst, loss, hope, forgiveness and a palpable unforgettable love story. Ginger Scott has been one of those authors whose writing speaks for themselves. She never fails to deliver a book that is refreshing, touching, and heartbreakingly beautiful. I love how her books always finds a way to grip and tug all those heartstrings. And the story of Andrew Harper and Emma Burke was a devastatingly beautiful love story where readers are taken on a Ferris Wheel ride, where sometimes you are up, sometimes you are down, but in the end, you just need to enjoy the ride. I can't explain how much I loved this book because Ginger held my heart hostage with Andrew and Emma. Wicked Restless is one of those stories that allowed readers to be consumed with it's characters. Andrew Harper, the genius of the Harper boys. The brother who could get into college that he wanted to. But living in a small town, people talked and they automatically labeled the Harper Boys as bad seeds. When Andrew first laid his eyes on Emma Burke, it was like something in him click that arrows and neon signs were pointing to him that Emma is the one. As a young sixteen year old teenager, Andrew knew without a doubt he was in love with Emma Burke. He fell in loved with her vibrant personality, beautiful soul and her charisma. He would do anything for her. And Andrew proved that when he took the blame on a car accident that forever changed his life. Fast forward to five years later, Andrew is angry at the girl who didn't bother to write back and wait for him. He resented that his time away changed him to a broken man. Call it fate or what not, when Andrew is reunited with Emma, he is filled with a mixture of emotions. Hurt, betrayal, anger, loss,pain and emptiness are coursing through him. He needed Emma but at the same time he didn't. But one thing is for certain, Emma Burke was under his skin. She was the girl that he loved so much and having her reappear back in his life brought back a storm. A storm where he knew he had to face head on to find out why the girl he loved broke his heart five years ago. "The more she talks, the more I feel every scar on my body all at once- the burn marks, the stab wounds, the broken bones that never healed quite right- abuse I took so Emma Burke didn't have to experience anything sad." They say every story has two sides. And in Wicked Restless, Ms. Ginger once again pulls your heartstrings as you discover what really happened five years ago. Emma had a secret that she kept from Andrew. She was born with a heart condition that was life threatening. Emma needed a heart transplant in order for her to live her life to the fullest. Though Emma may have been born with a broken heart, her heart was filled with so much love for the boy who owned it. Andrew Harper was the only one that her heart yearned for. And so when she was reunited with Andrew, she was hurt, saddened by the way Andrew treated her. The way he could treat her as something of the past. But when Emma and Andrew finally had the chance to rehash what happened, truths and secrets begins to be revealed? Can love heal all the scars that were inflicted upon Emma and Andrew? Wicked Restless was more than a love story. This book was a prime example of why I love reading Ginger's books. She was able to incorporate the elements of love, forgiveness, hope, and second chances. And most importantly, Ginger reminds us all that every scar tells a story. A story that says, you have survived. And for Emma and Andrew this sentiment holds true. They are both survivors. They have both lived through the ups and downs of life and through all the hardships, they were able to find and fight their way back to each other. 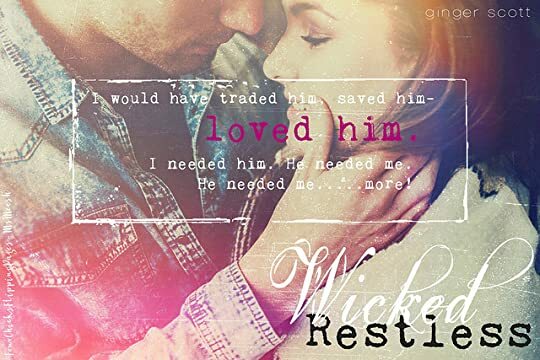 So if you are looking for a book that will tugs all the heartstrings and hold your heart hostage in this touching second chance romance, then I highly recommend you to read Wicked Restless. Wicked Restless is heartbreaking, beautiful and full of hope. Andrew and Emma met when they were kids, they instantly clicked the way no one else could with them. They spent time together and fell in love, but never really letting each other know how they were feeling. They were young and they made mistakes. When one mistake, pulled them apart from each other for years, their heart never healed. With confusions and misunderstanding, thoughts of revenge got in the way. Fives years later their reunion should have been bittersweet, but it was full of anger and hurt. Instead of talking it out, Andrew chose pain and revenge instead. As these two try to go through their lives crossing paths almost everyday, their pain and heartbreak never went away. With anger and unforgiving heart in the way, heartbreak will always win. This story is full of angst and heartbreak, it was a slow burn before Emma and Andrew got a second chance. Emma and Andrew had so much love for each other, that sometimes they couldn’t figure out how to show them. Every heartbreak they went through, my heart broke along with them. Then, with every step they took closer and closer to each other, my heart filled with hope and love for them. I wanted more of Andrew and Emma together. They deserved so much love and happiness, after all the things they went through. I wanted more, but instead they spent too much time apart, when they deserved so much more of each other.